So, to reward you all for hanging in there with me, even though I am not blogging as much, I am taking after my soon-to-be for sure Teacher of the Year friend Elizabeth at Fun in Room 4B and having a Pin It to Win It contest. All you have to do is visit my TpT store and pin ANYTHING you would like to own. You can pin one thing. You can pin everything. Then, come back here, with a link to your pin, and tell me why you wanted that particular product. If you pin more than one thing from my store, comment separately for each one (with the link to the pin and why you want it :) ) On Sunday, April 21, at 5pm PST, I will use a random number generator and pick THREE winners. Each of those winners will get the product that they pinned! My kids really enjoy these wipe off Comprehension Strategies and Skills Mats we have in the room. They really do love the fact that they can use vis-a-vie markers with them! haa haa I am currently using them to have the kids respond weekly to our Core Lit book, Mrs. Frisby and the Rats of NIMH. jibteach5, wonderwoman50, and jm....you are the winners. You all actually chose the same thing too! Paragraph of the Week will be sent to you asap. Just send me your email address to TeachinginRoom6@yahoo.com, and the Paragraph of the Week is yours! Congratulations! I'm not sure if I'm putting this in the right place. If this is wrong, let me know, PLEASE!! Because I REALLY want to enter your contest and win!! I love your stuff. I really want this reading log because at this time, I do the lame reading log where my kids write 3 sentences about what they read and have mom sign it...BORING...I love how your reading log has the kids actually thinking about their reading and doing more with it. I pinned a few things, but will just post about the Paragraph of the Week. Next year, I will teach just language arts/SS instead of all subjects. The Paragraph of the Week will be a nice addition to my ELA block! PS... love the hanger people! I love unique and creative ways to teach science, especially since science kits always seem to fall short, so I stock up where I can! An option to let kids create independently and learn about elements, yes please! What a fantastic little giveaway! Hope the rest of your week is a little more relaxing - almost the weekend! This weather activity would be a great addition to my weather unit in 5th grade. I like that it is something different! This math set looks amazing! You did a fantastic job on this and should be very proud! This would make a great addition to any classroom (including mine!). Thanks for the opportunity to enter! I pinned this! http://pinterest.com/pin/316096467566338713/ Somehow my kids struggle with problem solving! This will definitely help me with my writing instruction. So easy to use. This is an excellent resource that will help with math. Thanks. Oh my gosh, I am going to spend my whole day at your story and on pinterest! Okay one more and then I have to get ready. 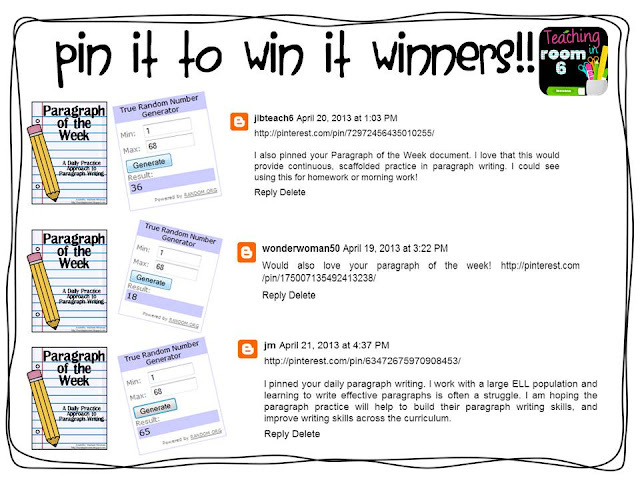 I love the idea of weekly paragraph writing! Woohoo! I LOVE Giveaways! Thanks for hosting. My students are really struggling with writing good paragraphs, editing, and proof-reading, so I would LOVE a copy of your "Paragraph of the Week" packet! I pinned your Reading Journal Log. Thanks for the giveaway! Love this Spiral Math series - glad to see Quarter 4 and hope to add it to my collection. I absolutely would LOVE to win your paragraph of the week! If I don't I'm buying it!! One of my goals for next year (yes, I know schools not out yet...but I'm already prepping! )is to do more writing! This would be ideal! You have so many great products it was hard to pick! I pinned the Paragraph of the Week. I want the paragraph of the week because I think it would make my third graders better writers! I want calendar math because ever since I read your post so long ago, I've wanted to do it! Now I can have it ready for next year! Problem solving 2 ways... Common Core... enough said! We are about to do our unit on the Holocaust while reading the book, Number the Stars. We will be studying all of the good people that saw evil and tried to help, however small their contribution. I can't think of a better way to display our "heroes" especially now when there seems to be only evil-doers in the news. I can just see them hanging down our hallway! We will begin testing in May. The 5th Grade Spiral Math Homework and Quizzes bundle will be great for review this year. It is hard to find a great resource to help students with their writing. I would use this to help students with their writing. I'm always looking for resources to help teach weather. I have 1-3...just need the 4th! This is the most amazing product...love, love, love it!! It has been so awesome to watch my students as they grew in confidence and mastery of their math skills. I can't wait to see the results from their state tests! Thank you, Stephanie, for this truly outstanding math program...and for ALL you do and share with us!! :)Have a great ending to your year! Seriously, this is the best investment I have ever made for math instruction with my 5th graders! The way I have used it is to assign ten problems each day. The next morning, the studetns break into study buddy groups to discuss their answers and methods of solving each problem. Then, we come together as a whole group, and I draw names to come up to "teach" each problem to the class on the white board. We discuss different strategies and methods. It takes about 30 minutes, but what a joy to watch and listen to my students as they grow both in their math skills and their confidence in themselves as mathematicians. Thanks, Stephanie so very much!! I will be moving up to 5th grade next year and will need all the resources I can get! Thanks for the great opportunity to win something! I just had to pin one more - this looks like an awesome resource and will help me transition to 5th grade. I also love how commenter Jody explained her system for using. Thank you! I pinned your All About the Elements project. I would love to use this project next year to help the students dive deeper into the science curriculum. I also think it would be a great Open House display! Thank you for this contest and all of your awesome posts! I also pinned your Paragraph of the Week document. I love that this would provide continuous, scaffolded practice in paragraph writing. I could see using this for homework or morning work! I pinned the Comprehension Strategies & Response mats because I am always looking for way to easily incorporate differentiation, and this does the job! By laminating them, I can save copies and the kiddos love using the wet erase markers. I pinned your Math Spiral Quizzes/HW. I bought the first 2 I think... I love the HW b/c it helps the kiddos w/ spiraling back to review! Oh man. There is so much on my wish list from your store for next school year! I teach 4th grade with a gifted cluster, so I have to differentiate my materials - especially in math. With our switch to Common Core, I feel like I'm starting all over again. This bundle is my top choice, simple because it gives me an entire year of differentiated homework for my high-achieving students. Love it! Each of these 4th grade homework/quiz bundles will be perfect for my class - for the same reasons mentioned above. I love that they're common core aligned, spiral, and include quizzes. Perfect! Quarter 3 of the 4th grade Homework/Quiz pack is next. Constant review is what helps kiddos keep skills fresh and remember them for the next year! I would like to win this b/c one of my weaknesses is reading. Fractions and Decimals are a weakness for my kids. Would like to win this. Two more - 4th and 5th grade problem solving in math. I need to do something to elevate my students' problem-solving skills. These look like a great tool to have in my problem-solving belt. Last one - 4th grade problem solving. Anything that is common core aligned in math is a bonus in my book! I would love this Bundle for my 5th grade math centers and extra homework practice our books do not have enough practice pages. Hey there, friend....I, too, am busy, busy, busy (with no baby to blame it on) and just now having a chance to say "Thank You!!" for the vote of confidence and for the shout out! You are the best, Stephanie! I have qrt 1 and 2 I need 3 and 4. My students are still struggling with word problems. I LOVE the mats!! and we can't practice comprehension enough!! I LOVE the Spiral Review and would love to use it with my 5th graders! http://pinterest.com/pin/128774870567601329/ I want the spiral review. I love sending it home for homework. I have bought one quarter and need the ohther 3! I love the spiral math! A few years back, I read some research that said to not use reading logs because they weren't genuine and just led to parents hastily filling it out on Monday mornings before heading off to school. Since then, I've been disappointed in the quality of the nightly reading of most of my students. I feel that the reading log for thinking will help promote those high level thinkers that I'm sure have fallen through the cracks. I pinned your daily paragraph writing. I work with a large ELL population and learning to write effective paragraphs is often a struggle. I am hoping the paragraph practice will help to build their paragraph writing skills, and improve writing skills across the curriculum. I love that this activity combined so many skills in math. Students are often asked to combined concepts in final exams and this is a GREAT hands on prep using geometry, coordinate geometry and measurement. I love calendar math for the same reason that I love multi faceted activities. It combines more than one skill and serves to challenge students. I wish you had the a bundled pack of your 4th grade homework but I pinned quarter #3. Contest is closed...winners have been picked...will be back to announce them in a sec! Such a wonderful item to win! I bought your Paragraph of the Week a while back - this was the first year I started using it on a consistent basis and BOY IS IT MAKING A DIFFERENCE! Just wanted to say THANK YOU! And let those ladies (along with anyone else following you) of just how AMAZING that giveaway/purchase really is! Always an inspiration!